Are you a shower person? See our selection of top roses. Are you a bath person or a shower person? It seems the split is about half-and-half: a recent survey in the UK showed the country is almost evenly divided with 47% of people choosing the bath, and 43% the shower! Last month we wrote about Bespoke Bathrooms’ favourite bathtub designs, this week we look at the latest shower roses in interesting colour finishes and beautiful sculptural shapes. Lamp shower by Nendo for Hansgrohe-Axor Japanese design studio Nendo took its inspiration from the living environment outside of the bathroom and presents the natural fusion of light and water. 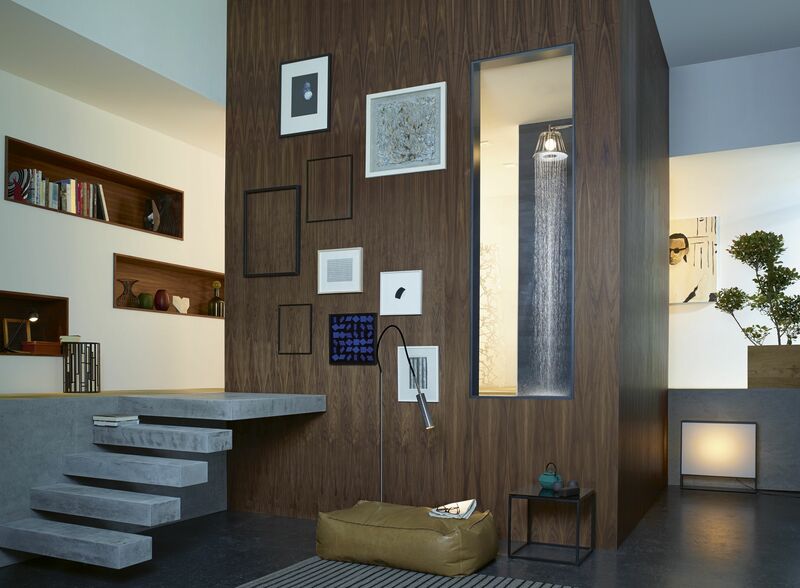 The underlying concept was to add a sense of homeliness to the bathroom, offering a humorous interplay between man, water and space. Architect Oki Sato, the creative mind behind Nendo’s playful, humorous designs says: “My designs are always very simple and minimalist, but never cold. My starting point is always the story behind the object.” Time and again he manages to achieve that ‘wow’ effect. Nendo enjoys playing with boundaries and loves creating little moments of surprise. 060 Round shower head by Aarhus Arkitekterne for Vola Designed by architect Torben Madsen the 060 can be ceiling or wall mounted and is available in chrome finish or in brushed stainless steel as well as a variety colors. The steel is hand-brushed in a circular motion to emphasise the shape of the shower head. It plays beautifully with the existing lines by this renowned manufacturer of taps and accessories in timeless Scandinavian design. Cyprium MEM shower rose by Sieger Design for Dornbracht Gold meets copper with the new galvanised Cyprum finish for Dornbracht’s bestselling MEM range. Eleven years after its introduction in 2003, this series now beams with a fresh glow: Dornbracht has revised the formal aesthetic elements of the series, adding products in the process and creating a new highlight in the pink gold ‘Cyprum’ finish produced using 18-karat fine gold with copper. 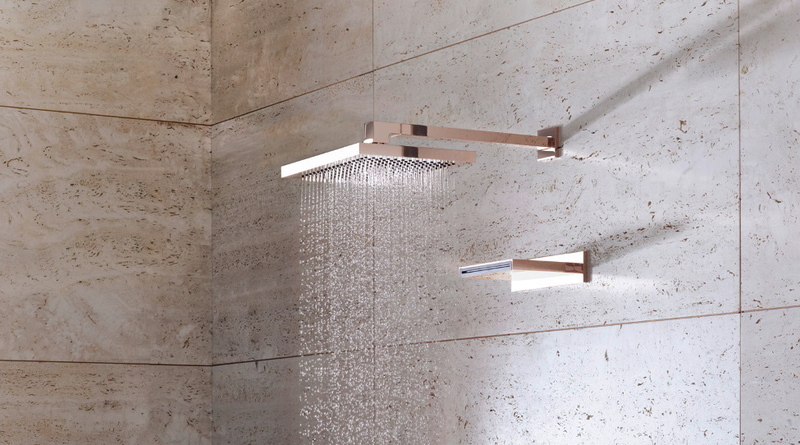 With its minimalist design, the contours of the shower rose reflect the natural fall of water and thus draw attention towards the element as it flows. Its dimensions have been resized to enable all MEM products to be freely combined with the outlets and operating elements of other series. Closer by Diego Grandi for Zucchetti Another re-imagining of the shower rose which takes its inspiration from the aesthetics of a lamp. A simple system designed with three joints, that ensure a multi-directional movement to control and direct the jet of water. 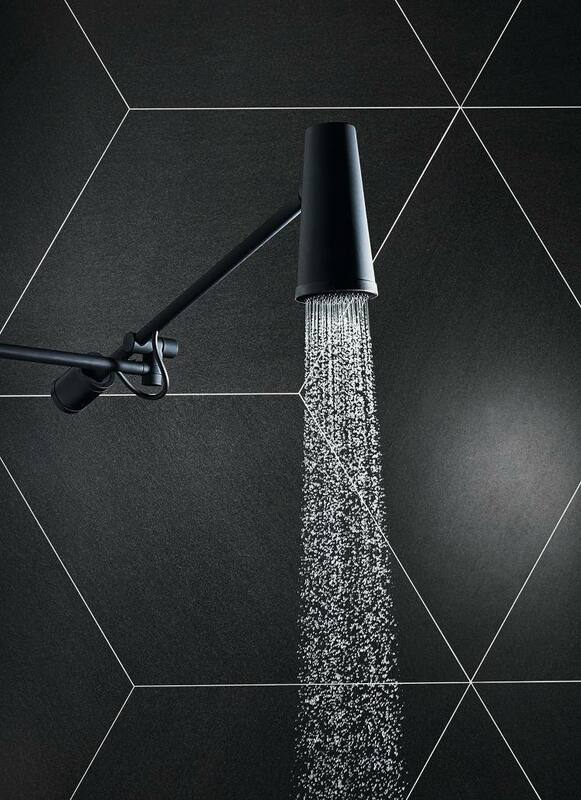 One can adjust and extend it as necessary, creating interesting lines and shapes in the shower. The cylindrical counterweight ensures the shower head is stable in any position. “The concept is simple,” explains Grandi, “the name comes both from your movement towards the water, and from the water that follows you”.